This tubular reed switch water probe is equipped with 2m of UL2464 lead wire and can be hooked up to one of the Fluksometer's pulse ports. 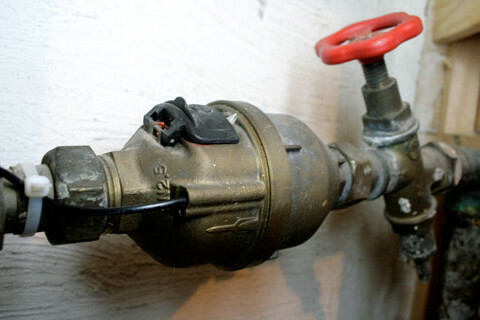 The probe is compatible with the Kent V100 'grenade'-type water meter. The FLM pulse port's meter constant should be set to 0.5L per pulse for this type of water meter. The image below shows you where the probe should be inserted into the meter. The cavity is protected by a black plastic cover. After you've removed this cover, insert the probe all the way into the top cavity. Secure the probe with some tape or a plastic cable tie.